Place egg and Parmesan cheese in separate shallow bowls. Dip each chicken cutlet in egg, then cheese, coating well. Heat oil in large skillet over medium high heat. Cook chicken about 5 minutes on each side or until no longer pink and cheese coating is golden brown. Remove from skillet; set aside. Wipe remaining oil from skillet. Pour pasta sauce into skillet. 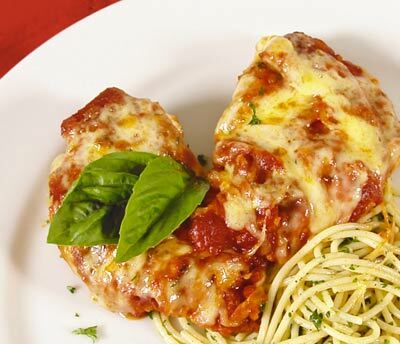 Arrange chicken in sauce; spoon sauce over chicken and top each with cheese. Cover skillet with lid and heat over medium heat about 5 minutes or until sauce is hot and cheese melts. Garnish with parsley or basil leaves if desired.